As a Baby Boomer child of the 1950’s, I realize how lucky I was to have been born in the U.S. in post World War II. The country was on a high of pride and relief that this war of wars was over and times were at the beginning of prosperity. Industrialization was growing, with factories coming off of the being geared up for making products for the military and switching over to products that the post war families wanted to buy. This was a time of not much money for many families, but it was also the beginnings of credit for the average family and buying on time or buy now, pay later. Gradually, middle income families were beginning to buy new homes, furniture, washing machines, and all of the innovative products that were coming out. To be a child of a middle income, suburban family in the 1950’s was a very fortunate thing. Now, I have to make a note that of course, there were many still having very hard times and that needs to noted. This is not a posting of ignorance or gloating, but one merely stating how fortunate I, and many other children of these times were to have been born where and when we were. These are years that I will never forget, when my parents were still young and although facing all of the difficult decisions that new families do, there were jobs and the cost of living actually allowed one parent to stay home and raise the children. 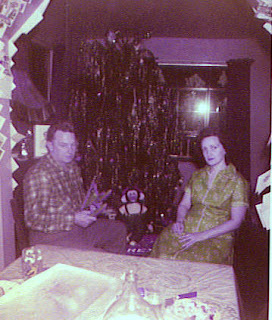 The Christmas season was a glowing time in my house, as my father was full of Christmas and loved doing everything to excess. This could make for difficulties for my mother as she had to find ways to save money to make sure the family had the necessities, but you couldn’t really contain my dad when it came to Christmas. I even missed some of his younger years and heard others tell the stories of some of the things he did that neighbors remembered as wonderful. I wished I had been there to enjoy some of them as well. My father always loved music, although he didn’t learn to play any instrument well. He did learn to play the guitar when he was very young, so I’m told, but he stopped for some reason and never played anything again. 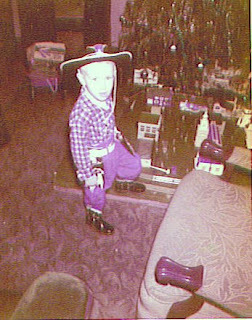 His father was well known for playing honky tonk piano when he was very young, by ear. He never had any formal lessons. 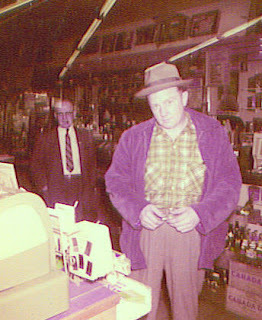 I am told I inherited the love for music from my grandfather. During Christmas, my father would put large speakers outside and play Christmas music records all night on Christmas Eve. Neighbors told me this and that they would open their windows a slight crack to hear the music and how much they loved it! My dad was also known for being Santa Claus on Christmas Eve, again, before my time. He would dress like Santa and go all through the neighborhood to each house on Christmas Eve. This was not a planned event, but just something that he wanted to do and the neighbors loved him doing it. They were all about the same age and had young children who just loved Santa coming to their homes. The funny part of the story, except to my mother, was that each house gave my father a shot of cheer, or whiskey, so obviously when he arrived back home, he was, as the expression goes, three sheets to the wind. Another year, when I was around, as my father and I loved to put up the train platform during Christmas, he decided, while my mother was at work, to put the entire giant train platform, which was 12 feet by 12 feet, in our living room. (photo at left) Now, we had a pretty small house and this turned our living room into a narrow passage way to the dining room. You had to walk in the front door, close to the wall, around the platform display to get to the dining room. To tell the truth, I don’t actually remember where we sat or where the living room furniture even went. It didn’t matter much to me. 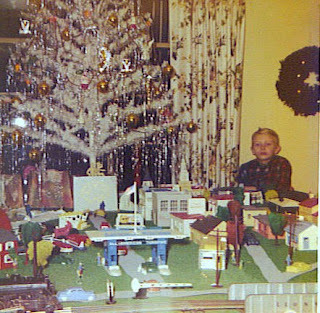 I was about 10 years old and all I knew was that my wonderful train set was the center of the house. If you see a pattern here that reminds you of the beginning of the movie, “Mrs. Doubtfire” when Robin Williams played a father who was all about fun and his wife, Sally Fields, played the frustrated wife who had to make sure bills were paid and clean up the messes that he made. As I was very young, I am not sure, but I would say that is probably how my parents were. My mother was always too serious and my father was probably too excessive when it came to enjoyment. (my mother doesn't look very happy at the moment of the photo on the left) Somehow, they managed to deal with their character traits, as they remained married until my father died at the age of 74. All I can say is that my dad made our lives fun and full of wonderful memories. My mother was too serious, but I can totally understand how frustrated she probably was and I realize that she did her best. They both did a great job providing us a good home and did the best they probably could. We all make mistakes as parents. Without my mother keeping my father in check, we may not have had the home and lifestyle we had. Without my father, we would have not had the lifetime of wonderful memories we had.